The CDJ-900 Nexus utilizes a large full-color LCD panel to display a window of music information including track title, artist name, track number, time, tempo, beats per minute, and wave form. Users can then transfer the analyzed music files to their preferred storage media and play them directly from the new CDJ-900 Nexus. The software offers song information that can be viewed easily during performances on the player’s large display for quick search and access of content by genre, title, BPM, and more. In addition, as analyzed tracks are played, the unit automatically creates and saves a play history for review of past performances. 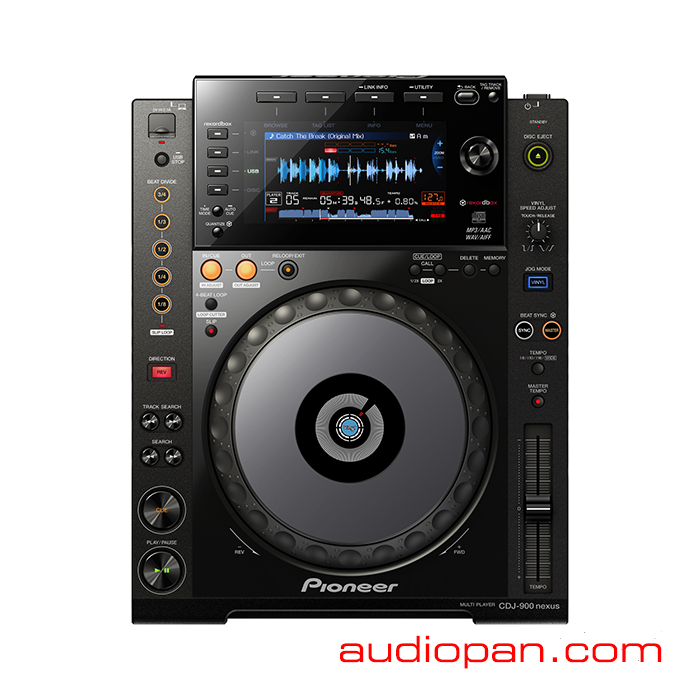 The CDJ-900 Nexus is equipped for conventional and wireless connectivity. The player enable users to utilize iPhone, iPad and iPad touch devices or Android OS devices as the source for music content and can be connected via USB or Wi-Fi. When used, the touchscreen of the connected devices becomes the navigation tool for content. For additional convenience, the included Mac version of rekordbox enables the CDJ-900 Nexus to connect to a home network and retrieve music content wirelessly from a network connected computer. Adapting to today’s variety of media formats, the CDJ-900 Nexus enables playback of MP3, AAC, WAV and AIFF audio files from CDs and USB memory devices. A USB port located on top of the player enables users to switch out external storage devices quickly to minimize the need for connecting to laptop computers. The CDJ-900 Nexus is built with numerous DJ functions for increased performance capabilities. Beat Divide – A newly integrated function of the CDJ-900 Nexus, the Beat Divide enables a single beat of sound to be divided in ¾, 1/3, ½, ¼, and 1/8 increments and played for a specified number of beats without breaking the rhythm of the music. My Settings – The function settings of a player can be saved to an iPhone, iPad or iPod touch or USB storage device. For additional convenience, the settings can also be made on the rekordbox App or software, giving users the ability to switch to their settings when connecting to a CDJ-900 Nexus or CDJ-2000 Nexus.